Before I share everything I learned, I need to inform you why I met with all of my students. This year, for many reasons, when it comes to assessing learning, I have decided that I will no longer use points. Instead, I am asking my students to apply the standards through purposeful effort on their assignments, on submitted work I am giving them feedback only (no mark), and I am holding a conference with them at the end of each grading period. They bring a showcase of their learning to the conversation, and together we determine the letter grade we will send home. Let me tell you, when a teacher has 35 students per class, and that teacher chooses to dialogue with each one of those students throughout the week, “exhausted” is not strong enough of a word to cover the feeling at the end of that week. Especially if that teacher is introverted. Even though it was tiring, it was also energizing! There were so many new insights that I gained by walking through this process with the questions I set before them. Most of my students are really honest people, sharing with me their struggles in learning. Students can be adept at connecting standards with their learning in surprisingly specific ways. Students are making connections from the learning in my class to the learning in other classes, showing that they are capable of transferring their learning all on their own (All I had to do was ask them about it). Framing the first two questions where I ask them how they have grown “as a reader” and “as a writer,” they responded in a way that showed me they were taking ownership of their development in those two roles, those identities. Choice equals ownership, as student after student told me that they have grown as a reader and writer BECAUSE I have let them, to a certain extent, choose what they will read and what they will write. A surprising amount of my students told me how lazy they were, preferring to choose fun over doing work. This means that they do not posses an adequate executive function (the ability to streamline their lives, so they can handle all their commitments), and they do not know the next steps to develop this capacity. Without points, I was in a position to get to know my students and the authentic story of their learning. And it was incredible! In a lot of ways, I was able to see my students, really, for the first time in my career. Up until this academic year, for the majority of my students, the only story that unfolded for me was the one in the grade book. Looking at that spreadsheet, I would interpret the point values in the grid of boxes as an unfolding narrative. I would assign identities to my students, like “good,” “hardworking,” and “lazy.” The only plot points I had in that narrative were the points in the boxes of the grade book. After 170 conversations in one week, I have learned that the narrative I was building about my students has been almost COMPLETELY WRONG. I talked with stellar students who didn’t want to give themselves high marks because they were unfairly comparing themselves to higher achieving students. Some of my students who were not submitting all their work have been living with acute stress and anxiety of a magnitude that I would not have been able to understand when I was their age. What my students shared with me during that week opened my mind, and heart, to see them in a completely new way. It was a revelation! In all of those conversations, there were several that had a common thread. And the sum total of these conversations had the greatest impact on me. I don’t want to break the trust I have earned with my students by sharing the details of the conversation, so here’s what I’m going to do. I will take four impactful conversations I had and combine them into a dialogue with one fictitious student; let’s call her Elena. Below I will write out how this imagined dialogue with Elena could have gone. Ready? Me: Hi, Elena. We’re going to talk for about five minutes. I’m going to pose the five questions I handed out to everyone last week. As you respond to each question, I will read through your learning showcase. Ready? Elena: I think so. I’m a little nervous. Elena: There are a few ways I have grown. I really like that you have let us choose some of the reading, like the novel. That’s the first time I have read a book all the way through since junior high. And I would say that I am a better at understanding articles at a deeper level, like I understand the main points better. Me: Main points better? Tell me a little more about that. Elena: Well, when you had us break down the articles. 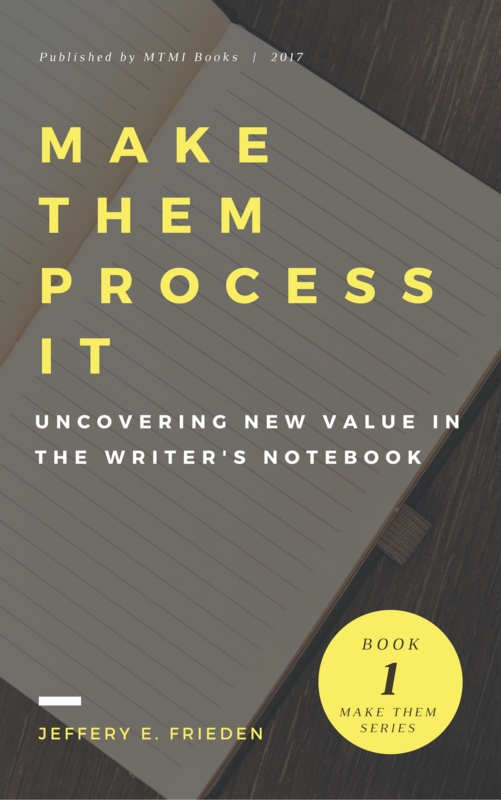 You know, where the intro ended, the conclusion began, and the chunks in the body, I was able to better see how an author puts together a piece of writing. Me: Oh, you mean when I had you talk in one-on-one conversations with all your classmates about how to break up the text? Elena: Yeah, that really helped. I have done this kind of reading analysis before, but hearing other people’s thoughts really helped me with my own. While Elena was talking, I was specifically looking at the assignments she submitted that demonstrating these skills. Her informal answers were squaring up with the work she had submitted for her showcase. And her formal reflections were aligned with her responses to these questions. Me: That’s encouraging for me to hear, to know something I’m asking you to do in class is deepening your learning. Next question, but it’s very similar. To what extent, or how, have you grown as a writer? Elena: I don’t think I have grown as much as a writer, but there are few things I have noticed. With The Writer’s Notebook, at the start of the year, I struggled to reach 150 words on an entry. I would repeat myself or ramble off topic. Now, I find that I have plenty to say, and I even have to cut myself off, or I’ll get carried away. Me: Great! Is there anything else? Elena: Yeah, when we wrote that argumentative essay, I thought I did a really good job, but then you pointed out that most of us didn’t include a counterclaim, and I realized that I need to do that the next time I have an argumentative essay. Me: Did you do the four square argument to fill in that gap? Elena: Yeah, look it’s right there. Me: Yes! Do see how to better anticipate the counterclaim now? Elena: Yes, I can do better next time. Me: Good. Okay, here comes a tough question. When it comes to you putting in full effort in this class, what is your #1 single biggest barrier? At this point in the conversation, Elena appears more uncomfortable than when we first started talking, which she admitted was causing some discomfort to begin with. At this point, I recognized that this is a difficult question to answer for a student, so I prepared to be supportive and gracious toward the student. Elena: I’m not really sure how to answer this question. I have been thinking about it, but I don’t really know where to start. Me: Well, let’s just start with this. What is the first thing that comes to mind when I ask the question? Elena: Well, to be honest, the first thing that comes to mind is me. Me: Tell me a little bit more. What do you mean that you are your biggest barrier? Elena: Well, I do homework for my other classes before I do homework for this one. Sometimes that means I don’t finish the work for this class. So, I guess I’m being lazy. Me: Elena, the last thing I would call you is lazy. I’m looking at the work in the learning showcase here. It does not communicate laziness. And I know you have signed up for some challenging courses this year. Courses more challenging than this one. Would you say that you are prioritizing those classes over English? Elena: Yeah. I’m sorry. Some of my other classes have lots of homework, and if I don’t get started right away, I get to tired to finish it that night. I really like this class, and I do want to get to the work, but I just get so tired sometimes. Me: Don’t worry, I’m not offended. I just wanted to take the opportunity to talk about it a little bit. In my experience as a teacher, most students don’t slow down and think about their habits. And that’s what I’m trying to get you to do here. Also, this helps me see the story of your learning this year. So speaking of habits, let’s move on to the next question. This school year, what is one key insight you have gained about yourself as a learner? At this point in the conversation, Elena showed more signs of discomfort. My intuition was telling me that there was something that she was brooding on, a real issue about school that was bothering her, and she was either not sure she wanted to let me in on her thinking or just move past the topic as graciously as she could. Me: Well, with any class, but let’s start with this one if that’s easier? Elena: Well, okay. Let’s see. So, sometimes I don’t do my work for this class. And, well, it’s hard to say . . .
Me: I can tell you have something on your mind, and it’s okay to share it. I had a question, and you have a response. What you say next cannot hurt your grade in anyway. At this point, I kicked into active listening. When talking to anyone who clearly has something they want to say, but they aren’t sure how to put it, I will communicate care, ask probing questions, and clarify with that person if their statements can mean more than one thing. Rather than take you through the twists and turns of the questions and responses, I’ll just lay it out as a lucid train of thought here. Elena: Sometimes I don’t understand what to do for some assignments you give. But everyone else around me seems to get it. Sometimes I ask them if they can explain it, and afterward I still don’t get it. Then I get overwhelmed, and I put it off. So, I don’t do work for you class because I don’t really know what to do next. When I stop doing the work, I don’t think about it, and that makes me feel a little better. But then due date approaches, so I pull it back out, and then I get even more stressed and overwhelmed because I still don’t know what to do, and I’m even less certain about the assignment. Eventually, I just give up and don’t do it, or I rush it and tell myself I don’t care. But I care a lot. Me: Wow, that does sound overwhelming. I couldn’t imagine living like that week to week. Is this how it’s always been for you at school? Me: So when did this start? Elena: When my friends started taking AP classes a couple of years ago, and I chose to focus on sports instead. Me: Oh. Would you say your friends started to really accelerate their studies then? Elena: Yeah. Some were doing sports like me, but they seemed like they could get it all done, and I couldn’t. Me: Hmmmm. Well, seeing the courses you’re taking now, is it fair to say that you’re trying to keep up with them a little bit? Me: I know a lot of your friends took AP Lang last year, and that teacher and I talk a lot about our teaching, so I use some of the same teaching strategies and activities. I’m sure your friends talk about how they “did this last year” and it looks like they “get it” right away when I assign those activities. Does that cause you to compare yourself to them? Me: When that happens, do you tell yourself things like, “You just don’t get it,” and “Why try? just give it up”? Me: But, you ARE a good student, so you probably also tell yourself, “You can do this” right? Me: So, let me get this straight. You have two voices saying two different things. One says, “You can’t do it, you’re no good.” And then you have this other voice saying, “You have to get this work done. Look, they get it, so you can figure it out.” Is that right? Me: Oh my goodness, that sounds like a lot of pressure. I can only imagine how stressed out this makes you feel. And when I said this, Elena’s eyes started welling up with tears. For me, I could handle the building tension in the conversation, but generally, I don’t really know how much my students desire to share that with their teacher. I paused for half a second, expressed empathy, and then readied my next question. Me: Okay, and now for the tough question, where the rubber meets the road. From the start of the course, up until now, what letter grade best communicates your achievement (i.e. exams & artifacts), your level of effort, and your level of mastery? This question breaks down that final barrier with Elena and tears begin falling down her face. (At the bottom of the post, I’ll leave a link to the descriptive grading criteria I use with the students so you can see how I help guide them toward a helpful interpretation of their learning in my class). Elena: I don’t know why I’m crying. Me: Well, this is not easy. If we circle back to your responses to questions 3 and 4, it sounds to me like what you’re describing is like a tennis match. Each side is hitting the ball back and forth (You can do it, no you can’t), and you’re the ball. Am I on to something here? Me: That sounds really tough. On top of all of it, you seem to be comparing yourself to your friends, thinking that you aren’t “good enough” and that you “don’t belong here” because you don’t get it as fast as they do. Is that right? Me: So, when you’re thinking about your answer to this final question, are you comparing yourself to your classmates who get it right away and get the work done with apparent ease? Me: Hmmmm. Well, I’m not asking you about them right now. I am just asking from me to you. I know it’s difficult, but what way are you leaning in answering this question? Elena: Well, of course I want to say an A, but I just don’t think that I deserve it. I have missed a few deadlines. I haven’t done every single assignment. And I haven’t always been in class. Me: Oh no, I’m so sad to hear that. That really breaks my heart . . . I want you to know that is not what I want happening in my classroom with you or any student in your situation. And I know I can’t completely change your mind through this one conversation right here, but I have to tell you that you do good work . Really good work. I mean, it’s right here. It may not always be on time, and it may not be perfect, but I see a student struggling to learn right here in front of me. And when I give instructions, and I tell everyone to get to work, I do NOT compare you to anyone else in here. I only look at what you’re doing. Just you, me, and the work. That’s it. I hope you can see that I mean it. Elena: Yeah, I know you mean it. Still, it’s hard to convince myself. Me: I don’t want to make this any more difficult. Just say the first letter grade that comes to mind. Ready? Go. Me: Okay, now we have something to work with. But let me read the descriptive grading criteria for an A. “Consistently produces exemplary work; missing few or no artifacts of exemplary work.” Is that in your showcase here? Yep. “Exhibits careful, purposeful effort in learning at all times.” Well, maybe not ‘all’ times, but that is your habit. “Meets all learning targets (standards) fully, frequently, and/or consistently.” All? Maybe not all, but the vast majority. “Turns weaknesses to strengths, showing evidence of growth.” Yeah, I see that in your showcase too. So, let me ask you one more time, what letter grade comes to mind? And remember. You, me, and the work. No one else. Elena: Okay, I would say, like an A – . Me: Whew! That was difficult, but yes, I can agree with that assessment. Elena, you are a great student. You have a good mind, and though you may struggle a bit more than a few of your peers, I have to say I am proud of the work you do. I couldn’t ask for a more conscientious student. This was a great conversation, and I thank you for sharing your struggles in learning with me today. I look forward to even more success in the next grading period. Elena: Thank you, Mr. Frieden. In a few of the conversations, I would go on to describe how working memory functions, and how carrying that internal dialogue (hosting the conversation in their head) was actually hurting their processing of content, causing less content to move into their long-term memory. Also, I explained that mistakes and missteps coupled with effort is what leads to authentic learning, so they were really learning MORE than some of their classmates, and that made this teacher happier than those who may appear to do the work effortlessly. And this little nugget appeared to have a dramatic change on these students’ attitude about their standing in my class. Viewing students through the points they have earned (or not earned) in my class gets in the way of the real story of their learning. There is so much more going on. Students struggle to see their own worth, and they crave the validation they get from complying with their teachers’ learning demands (at least that’s true of my high achievers). Students are stressed out in ways I had never considered before. Adults born after 1990 have no idea what it’s like to be a teenager in a world that puts a smartphone in everyone’s hand. In order to focus the way I did when I was in school, students have to learn how to say ‘no’ to so many more distractions than I could ever have imagined when I was young. My students need help with this, but few, if any, of the adults in their lives recognize this as a problem that young people face, and so no one is preparing them to deal with it. Students are more than capable of learning how to assess themselves as learners, if we would just show them how. One final thing. Here’s the link to the descriptive grading criteria I use (adapted from the great work of Arthur Chiaravalli): CLICK HERE. If you found meaning in this post, please hear Soleil’s story in her words right here. QUESTION: What suspicions do you have about how learning is commonly assessed? Please, leave a comment below, and share this post with anyone you know who is looking for for a new way to assess their students’ learning. The entire conversation (condensed as representative) shared here is illuminating. It is no wonder that you were drained—and energized. I especially benefitted from the negotiation phase when you ask “Elena” to use the rubric as a way to self-assess.It’s too bad that, because of the system, that negotiation has to culminate in a letter. Fortunately, the learning goes much deeper than that and lasts longer, too. Thank you for posting. I had an inquiry into what my other 34 students were doing when I was talking with 1 person at a time. They were given a HyperDoc, but in the style of Tracy Enos (find out more here: https://www.cultofpedagogy.com/student-playlists-differentiation/). So, Students did one of two things: (1) they worked on their learning showcase (mentioned in the post), or (2) they worked on the HyperDoc. I would just check in with noise level from time to time, and ask them to raise their hands if they were on a certain step in the HyperDoc. If they couldn’t, then that caused a little bit of accountability and motivation, getting students to get back on track. If you have further questions about this, please reply to this comment. Great job. I have been doing these conversations for four years now and they are the best weeks of the school year. I teach mostly Government, but also Sociology and Psychology and have moved to much more individualized choice of topics and class time. My classes are times to work or be in small group discussions. I also try to interact with each student on a daily basis by checking in on their progress, asking questions, giving some ideas of where they may want to go with a topic. We as teachers need to teach the kids, not the subjects. Keep doing what is best for kids. This is amazing. I’ve been trying to talk my department into doing standards-based grading and mastery learning, and this gives me some excellent tools to re-open the conversation. On a side note, I don’t see the link to your “descriptive grading criteria.” I would love to see it. Oops! I just went and added it at the bottom of the post plus the source where I initially discovered it. Thanks for pointing that out! My school requires that we assign at least one grade per week, on average. How would you fit this style of self-assessment into a traditional grading system? Kevin, Sorry for the late reply. I did give this quite a bit of thought. My gut reaction was, “It’s not doable.” But then I started thinking about it, and it’s just another barrier to work around. After thinking it through, I recommend you have students do weekly self-assessments, then use those for the basis of reporting a letter grade week to week. 1. Starr Sackstein’s Teaching Students to Self-Assess: https://www.amazon.com/Teaching-Students-Self-Assess-students-learners/dp/1416621539. It’s a brief read for busy teachers, one that you can get through in an afternoon, and it has use-in-your-classroom-next-week content. 2. Checkout Aaron Blackwelder’s post: A Better Progress Report: Using Google Forms to Communicate Learning here: https://mrblackwelder.wordpress.com/2018/01/01/a-better-progress-report-using-google-forms-to-communicate-learning/ . It won’t be something you can take and use directly, but it should give you some great ideas about how you can get students to self-assess for a weekly letter grade report. I hope this helps and brings you to a spot where you can implement a new approach to assessment of learning.